TEMPERED GLASS PLATFORM AND HIGH-PERCISION SENSORS: Large 3.55*1.58 inch Large LCD display with Blue backlight. 6 mm tempered glass platform. 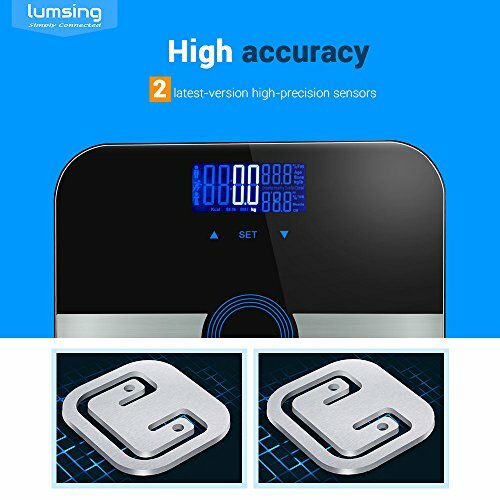 2 latest-version high-percision sensors. Auto power-off, Auto zero, low battery and overload indication. 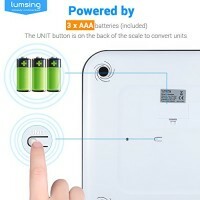 It is slim and portable for easy storage. 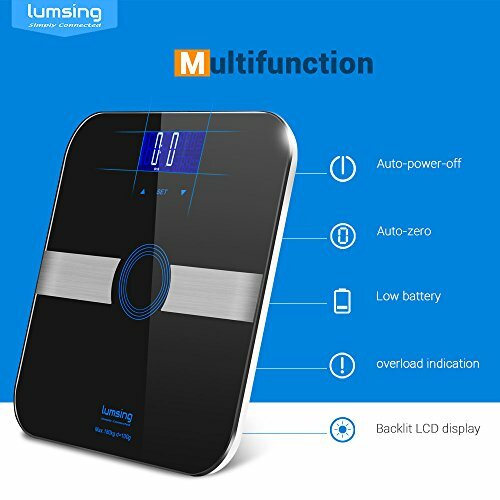 MULTI-FUNCTION: Accurately track your Body Weight, Body Fat Percentage, Body Mass Index(BMI), Body Water, Muscle Mass, Body Bone and Calorie. 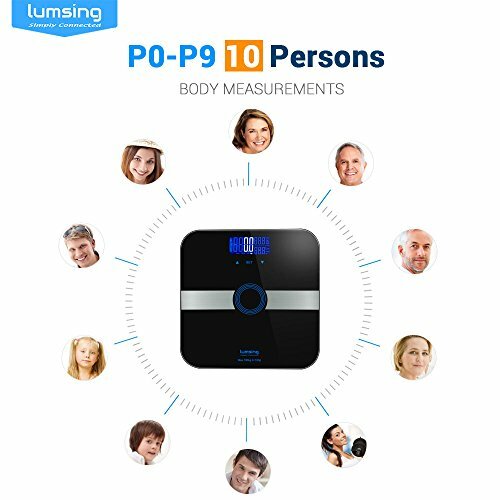 10 USER BODY MEASUREMENTS: 2 available units(lb/kg) of measure. Measurement Range: 4lb-400lb / 2kg-180kg. 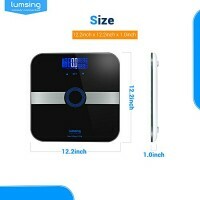 The smart body scale can momorize up to 10 persons’ body measurements. 1.If you want to convert the units, please turn to the back of the scale to find the unit icon. 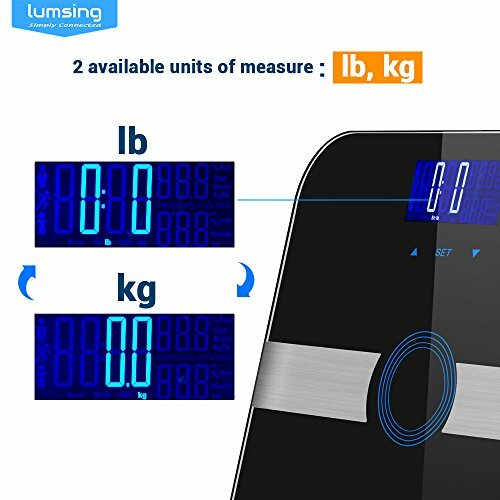 2.For accurate weighing, please lay the scale on hard and flat surface, and stand on the central area. 1. 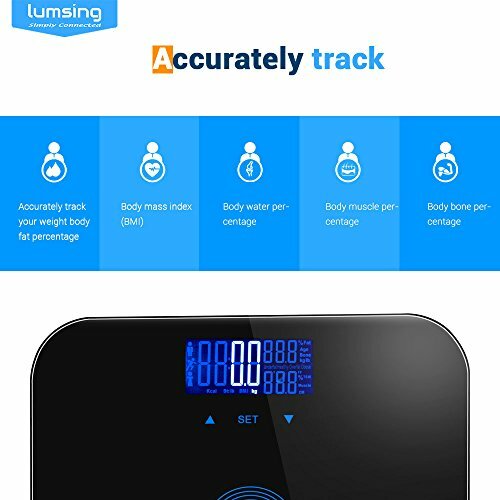 Please try again and make sure to stand directly on the scale’s surface to ensure good contact between your bare feet and the metal electrodes beneath the glass. 2. 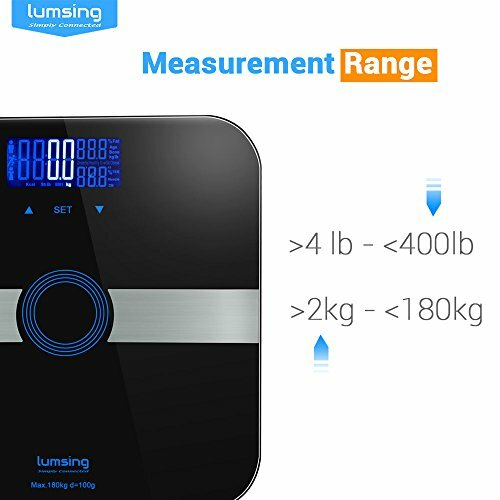 Make sure the surface of the scale is clean. If not, you can clean it with a slightly damp cloth. 3. Make sure the Personal Data is correct, such as gender, weight and height. If you have any other concerns or questions in any regard after receiving our product, please feel free to email us. We will do our best to provide premium services for you. SAFE AND USER FRIENDLY: Ergonomic rounded corners help to prevent you from getting hurt. 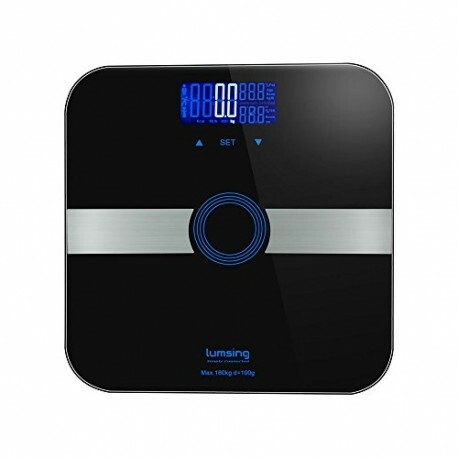 You rest assured that you can use this weight scale safely and conveniently. POWER: 3 * AAA batteries (included). 2 Years Warranty.